If you're looking for a way lower your vehicle to give it better handling and a little better stance without having to resort to the inherent harshness that oftentimes coil overs may have, then you will be pleased to choose from a large variety of lowering springs that you can choose from. 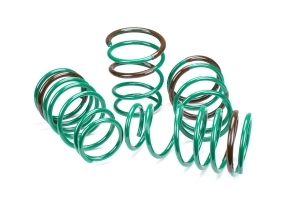 These lowering springs differ from different spring heights and different weight ratios. Also included with the Lowering Spring Kit are a set of camber bolts to allow users to achieve a proper alignment after lowering a car. These are premium camber bolts specifically designed to accommodate a lowered vehicle. This is all included in a convenient package that once installed will improve the handling, and looks of your vehicle. RallySport Direct proudly carries a great selection of TEIN suspension products for those of you looking to improve the balance and handling of your vehicle for the track or spirited driving. On this page, you are looking at the Tein S Tech Lowering Springs. These springs will provide your vehicle with a more aggressive appearance along with improved road handling capabilities. Each application has been tested in North America for the proper balance between performance and comfort. RallySport Direct is proud to carry a great selection of quality suspension products brought to you by Epic Engineering. On this page, you are looking at the Epic Engineering Lowering Springs. This is a complete set of springs for the front and rear of your vehicle. RallySport Direct is proud to carry the Eibach Pro-Kit Lowering Springs. This is a great way to improve the handling, performance, as well as the looks without compromising your overall ride quality. RallySport Direct proudly carries a massive selection of quality suspension upgrades brought to you by Whiteline. On this page, you are looking at the Whiteline Camber Bolts. These bolts have been designed to provide you with more camber adjustment from the lower suspension mounting point. The Eibach Camber Bolts are designed for non-slotted struts. This will allow for both positive and negative camber changes up to approximately 1.75 degrees (depending on your vehicle) by replacing the OEM strut/spindle bolt. This is an easy means of adjusting just by rotating the head of the bolt. Each kit comes provided with two cam bolt assemblies which are enough for both sides of the vehicle. Sold as a pair, and are made for the front location.